In the year of 1902, a couple of young men from Sioux City, Iowa, located on a homestead in eastern Meade county, South Dakota, and there they had built a cabin, fenced their claims and were making great efforts to establish for themselves a home out on the broad prairie. They were fine, industrious and honorable young fellows and at odd times worked among the ranchmen in the neighborhood in order to make the money for their several needed improvements. In the early days of the west the latch string was hung out and everybody that came to the home of the man on the prairie was welcome whether the hour of coming be day or night. On the 4th day of June, 1902, William Horlocker came riding into Sturgis upon a foaming horse and reported to the sheriff, John Smith, that the day before upon going to the cabin occupied by the men, George Puck and Henry Ostrander, he noticed that the door was ajar and in walking in he found before his startled eves the evidence of a foul murder and in going to the bed in the room he found it occupied by two forms who were strangely still beneath the covers. He turned the covering down and beheld their faces smeared with blood and crushed in a horrible manner. As investigation by the authorities failed to disclose any immediate clue but on the 6th day of June, 1902, a young half breed Indian had attended a picnic at Whitewood and had passed to one of the merchants in that little town a check for 125.00 drawn upon a Rapid City bank, made payable to Ernest Loveswar and purporting to have been signed by George Puck. The next day the check was returned to Whitewood by the Rapid City bank on the grounds that it was an absolute forgery. The cashier of the Whitewood bank thereupon called up Henry Perkins, cashier of the Meade County Bank at Sturgis, who immediately reported this information to Jesse Brown, acting deputy sheriff. Brown at the time was alone in town as both the sheriff and deputy were absent on other duties and he immediately proceeded to ascertain the whereabouts of the Indian, Loveswar, as he realized the check was an important clue pointing to the Indian as being implicated in the murder. Before he had proceeded very far he was met by Mr. Smith, the sheriff, who was returning from the inquest and who upon learning of the news from Brown decided to rest his horses and proceed out into the country in search of the Indian. Accordingly Smith and Brown, after a change of teams went to the Smith ranch on the Belle Fourche river, made another change of teams, and then after a night of travelling arrived at the place where they expected to find the man, Loveswar. Here, hiding their team behind some bushes just about sunup they quietly proceeded to the house, each one to take a separate door to prevent the escape of the Indian if any attempt should be made. There happened to be but, one door leading into the kitchen and as they came quietly without warning they greatly frightened the lady who was preparing breakfast. Paying no attention to her screams. Brown quickly moved to an adjoining room where he soon had Mr. Loveswar under arrest as he had left his guns in the kitchen. A close search of the Indian failed to reveal anything that would connect him with the crime. However, the Indian was taken along Avith the two men and a stop was made for a time at the Jewett’s road house where Sheriff Smith, who had not been asleep for two days and nights rested for awhile. While he was resting Mr. Brown did not ask the Indian any direct questions as to his knowledge of the crime but volunteered the information that the party, whoever it was, that had committed the deed made a mistake. The Indian thereupon became interested and asked in what way and Brown replied, “In not burning the cabin.” This had the effect of causing the Indian to appear to be very much occupied in deep study and convinced Brown that he had the right man. The next day the prisoner was taken to the sheriff’s office in Sturgis and very closely examined and questioned but he denied any knowledge of the crime whatever. He was finally asked where he was on the night of the murder and he replied, “At the Pete Culbertson ranch and that no one had seen him because it was late and he had slept in the barn.” The officers told him that two cowboys slept in the barn that same night and that no one else slept there, and in this way several other excuses volunteered by the Indian were rebutted until finally he weakened, broke down and cried and admitted killing the two men. In his confession he told that he went to the home of the boys and asked them to permit him to stay all night. They told him to come in and gave him a cot to sleep on and he waited until they were in a deep sleep then he quietly took Puck’s gun from the wall, placed it to Puck’s head and his own gun to Ostrander’s head and then pulled the triggers of both guns at the same time. Then he procured an axe and crushed the skull of Ostrander but spared the head of Puck. After covering the faces of the dead men with the blankets he carried Puck’s gun away, but on the road near a Cottonwood tree he threw it away. The gun was later picked up by Frank Smith and Doctor McSloy. In due course of time a charge of murder was placed against the Indian to which he entered a plea of guilty but Judge Rice refused to accept the plea and ordered that a regular trial be held. States Attorney McClung introduced the evidence on the part of the State and Michael McMahon appeared for the defendant. The evidence on the part of the State of course was mostly circumstantial and the defendant on the other hand had no witnesses except himself. He took the witness stand and denied everything and claimed that the confession had been obtaind by duress and that he had been annoyed and bothered so that he did not remember what he had confessed to but the fact that he had told where the gun he had taken from Puck might be found and that the gun later was found just where he said it would be, and despite the fact that he explained the possession of the check as being the difference paid to him in a horse trade made with Puck whom he claimed wrote it out in the field, explaining the difference of the check signature and the original signature on file at the bank, the jury after retiring brought in a verdict of ”Guilty” and placed the penalty at death. Also see this auction lot of Loveswar hanging photos. 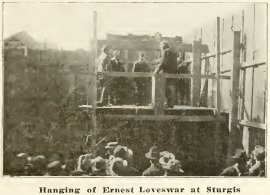 Thereafter on the 6th day of August he was sentenced to be hanged on the 19th day of September, 1902. The sentence was duly carried out on that day before a number of invited officials and within an enclosure erected at the side of the court house. This was the last legal hanging in Meade county.